This year we are feeling very comfortable as a family celebrating the O Antiphons. 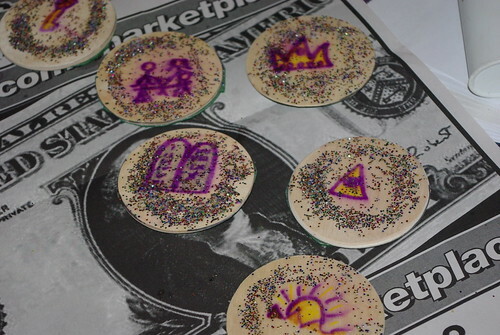 Izzy decorated little wooden disks to put around the Advent wreath every day before Christmas. I'll have better pictures when they are done drying. For a first attempt I think it's not too bad. O Sapientia: “O Wisdom, O holy Word of God, you govern all creation with your strong yet tender care. Come and show your people the way to salvation.” Isaiah had prophesied, “The spirit of the Lord shall rest upon him: a spirit of wisdom and of understanding, a spirit of counsel and of strength, a spirit of knowledge and fear of the Lord, and his delight shall be the fear of the Lord.” (11:2-3), and “Wonderful is His counsel and great is His wisdom.” (28:29). O Adonai : “O sacred Lord of ancient Israel, who showed yourself to Moses in the burning bush, who gave him the holy law on Sinai mountain: come, stretch out your mighty hand to set us free.” Isaiah had prophesied, “But He shall judge the poor with justice, and decide aright for the land’s afflicted. He shall strike the ruthless with the rod of his mouth, and with the breath of his lips he shall slay the wicked. Justice shall be the band around his waist, and faithfulness a belt upon his hips.” (11:4-5); and “Indeed the Lord will be there with us, majestic; yes the Lord our judge, the Lord our lawgiver, the Lord our king, he it is who will save us.” (33:22). O Radix Jesse : “O Flower of Jesse’s stem, you have been raised up as a sign for all peoples; kings stand silent in your presence; the nations bow down in worship before you. Come, let nothing keep you from coming to our aid.” Isaiah had prophesied, “But a shoot shall sprout from the stump of Jesse, and from his roots a bud shall blossom.” (11:1), and A On that day, the root of Jesse, set up as a signal for the nations, the Gentiles shall seek out, for his dwelling shall be glorious.” (11:10). Remember also that Jesse was the father of King David, and Micah had prophesied that the Messiah would be of the house and lineage of David and be born in David’s city, Bethlehem (Micah 5:1). O Oriens : “O Radiant Dawn, splendor of eternal light, sun of justice: come, shine on those who dwell in darkness and the shadow of death.” Isaiah had prophesied, “The people who walked in darkness have seen a great light; upon those who dwelt in the land of gloom a light has shown.” (9:1). O Rex Gentium : “O King of all the nations, the only joy of every human heart; O Keystone of the mighty arch of man, come and save the creature you fashioned from the dust.” Isaiah had prophesied, “For a child is born to us, a son is given us; upon his shoulder dominion rests. They name him Wonder-Counselor, God-Hero, Father-Forever, Prince of Peace.” (9:5), and “He shall judge between the nations, and impose terms on many peoples. They shall beat their swords into plowshares and their spears into pruning hooks; one nation shall not raise the sword against another, nor shall they train for war again.” (2:4) . Here are some delightful crafts and antiphon activities in my del.icio.us files. I finally did purchase this for this year and it is beautiful! It will add so much to our evening meals. Also the Christmas Novena can be started today! Christmas Noven and also here.